I’m over the moon to have been featured on this years PM Power List as “A New Voice” this is an honour (and if you see the powerhouse names on here, you would understand why I’m overjoyed to be among them!) 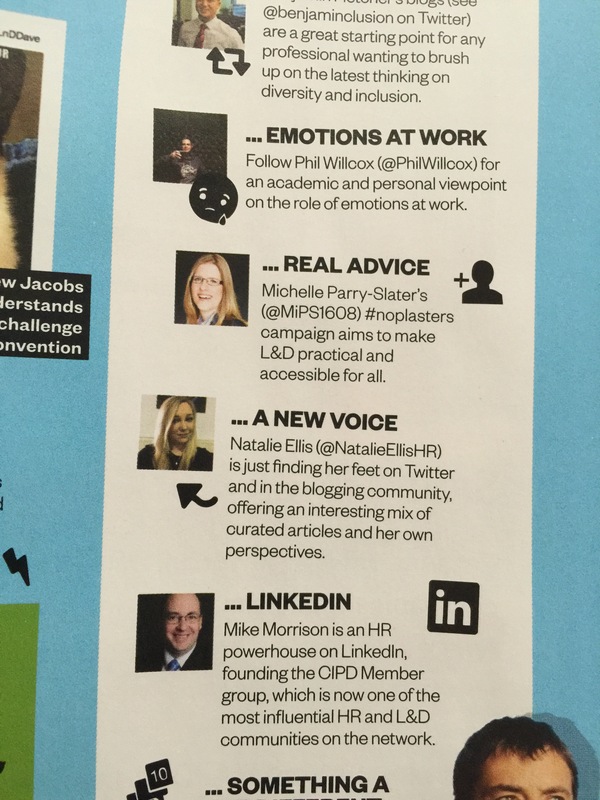 the list featured some of the most influential people in the world of HR so I’m very lucky to have featured. It’s because of your support and votes that I was featured so thanks a million and I will certainly be uploading more posts very soon. Steps Ahead Mentor? Don’t miss this years’ mentor summit! This year marks the second Steps Ahead mentoring summit, I have been involved in the planning stages of the event with the CIPD and trust me this is not to be missed! The event is taking place in central London on Tuesday 7th June, I will be speaking alongside other HR professionals on a panel in my Steps Ahead Ambassador role and if you are going I’d love for you to pop over and say hello. The event is almost full so if you haven’t got your space yet, I would suggest you book it ASAP! I am pleased that I can now share with you about the work I have been undertaking with the CIPD and I am excited to confirm that I have been featured in their new “The Power of One” campaign which has recently been featured in People Management and at the CIPD Learning and Development show. The campaign is centred around the importance of CIPD membership and how it underpins existing knowledge and how it enhances your career. It was really great to be a part of so keep an eye out for me! I was also featured in May’s issue of People Management on page 51, the “Who I Am” section. This is amazing as it is where they feature existing and future HR leaders. Thank you to everyone who has been in touch and congratulated me, it really is an incredible to be featured. Thank you to everyone who has got in touch with me regarding this post, I’ve been contacted from people all over the world which is really amazing! Without further ado, I’ll get straight into some of your questions. Thank you for your question Baba, to stand out more, you need to push yourself out of your comfort zone more. Focus on your strengths and improvement areas, then throw yourself into those improvement areas. If there is an opportunity to work on a project or even a task that is different, for example analytics then I would suggest giving it a go. We have to be a “Jack of all trades” sometimes and by giving the right impressions through the quality of our work, this is what enables us to stand out. It can take a while to see the results of your hard work but it gives you a solid grounding in the business where you’ll be seen as a loyal and reliable employee. Leah from London asked: I want to get into HR but I feel it is too late for a career change, is it too late and how do I start? Thank you for your question Leah, it’s never too late! When I was studying my foundation Level 3 HRP I was in a group where there were people in their late 40’s. Age is just a number at the end of the day and bears no reflection upon your capability to do a good job. Life is too short not to go for your dream career! If you have not worked or studied HR before but have transferrable skills such as administration or customer service then I would start applying for HR Administration roles, make sure you specify that you would like to study/work in HR on your CV otherwise recruiters may try to steer you in the career path that you are already in. If you want to study HR alongside your experience then I would research the Level 3 Certificate/Diploma in HR Practice. Mohib from London asked: Are there any specific websites for HR entry level roles and what are the transferable skills that would be good on a CV? Excellent question Mohib! Firstly there are plenty of main agencies that you could use that have HR divisions. HR is big business and most agencies will have an area which specializes in our profession and can easily find entry level roles. There are also specialist agencies such as Ashley Kate HR but you may find other more local agencies to your area. Don’t forget that employers also recruit directly so by going onto a job board such as Indeed, Reed or Total Jobs; you can easily locate roles in your area and it’s easy to apply. Secondly, transferrable skills, there are hundreds! I depends on where your strengths lay, for example, I started in customer services and when you look at it, HR is internal customer service so I play to that strength. If you have a financial background then HR analytics could be the perfect fit, the possibilities are endless and always make sure you convey the transitional links when applying for roles. There are plenty of options available to study for a CIPD qualification whilst working. It depends on which route you would prefer, for example the best option for me was distance learning as I have always worked full time since I left sixth form. Some colleges and universities offer part time evening studying options so whichever route you choose, all the best wishes to you and enjoy the studies! Thank you to all who submitted your questions, it really has been fantastic and I’d certainly like to do another soon so if you want to submit a question please feel free to comment below!